For fast cutting or welding jobs, the best oxy-acetylene torch kit should be easy to operate and lightweight. You’ll need hoses long enough to reach anywhere in the work vicinity, and control knobs that operate smoothly. Portability is a major concern, because you never know where you will need to take the kit for your next welding task. A key thing to look for is that the hoses are supple enough to bend around corners, but strong enough not to kink. Good oxy-acetylene torch kits do not have to meet industrial-use standards, but they should be UL tested and certified. 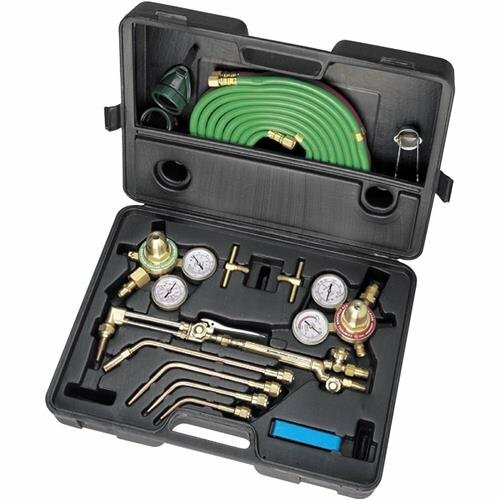 These oxy-acetylene torch kit models come from well-established companies, but are designed for home and amateur use rather than heavy-duty applications. While all of the kits below say they’re “ready out of the box”, for obvious safety reasons, the tanks are empty and will need to be exchanged at any welding shop for full ones. For more precision cutting, check out our favorite plasma cutters. Anyone with an interest in welding will recognize the Lincoln name. This Lincoln Electric oxy-acetylene torch kit is a great intro to oxy-acetylene welding pretty much ready to go right out of the box. All you need is to get the tanks filled/exchanged at any welding supply shop. 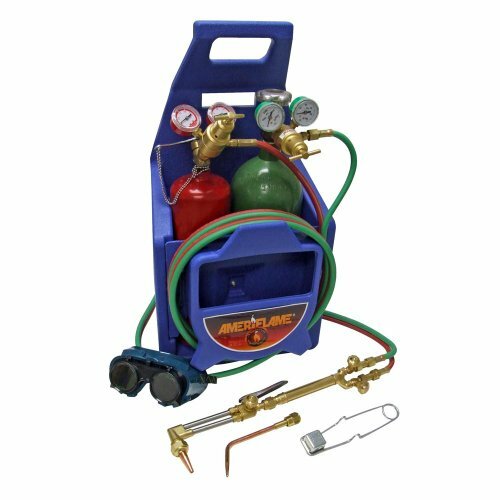 The portable kit includes a 12 ft welding hose, 20 cu ft. oxygen tank, 10 cu ft. acetylene tank, torch handle, cutting attachment, welding goggles, oxygen and acetylene regulators, welding and cutting tips, mixer, and flint striker. As-is, it can cut up to 1-inch and weld up to 1/16-inch. Add larger tips and a bigger acetylene cylinder and the numbers go up to 4-inch and 1/2-inch respectively. Compared to other all-in-one torch kits, the quality and fit/finish is top notch. Tanks are DOT certified so you won’t have any issue getting them exchanged for filled ones. The whole setup is lightweight and the nylon shoulder straps allow for easy portability. While it may not match the performance of a full size kit, you’re also paying a fraction of the price. Out of all the “portable” oxy-acetylene kits, this is easily the model to beat. Campbell Hausfeld is a leading tool manufacturer, and the WT400000AV is a good example of what sets the company apart. The torch is designed to fit your hand comfortably, so you can hold it as long as necessary without tiring your hand or wrist. The kit has everything you need except the gas, but connects to all standard tanks for easy use. If you have non-standard tanks, you may need to purchase adapters separately before connecting the gauges, but those are readily available at any tool supply company. The Campbell Hausfeld WT400000AV includes 5 tips to fit most common uses, along with accessories such as a striker tool and safety glasses. The hose is a dual-line combination which bends well, and being able to store the hose inside the case gives it extra protection for a longer life. The accessories are not as well designed as the rest of the kit, and you may prefer replacing them with higher quality products. For example, the safety glasses are little more than dark goggles, and scratch easily, which makes it hard to see what you are doing. A welding helmet or full-face shield will give you more protection and a wider field of vision. The striker is not very well made, but will work as long as you are not too rough with it. For easier lighting, invest in an outdoor grill lighter so you can strike a flame and hold it to the tip without putting your hand near the flame. An Ameriflame portable oxy-acetylene torch is considered to be the best for light applications. The small tanks it comes with make it especially portable as a complete unit, but they do not hold enough gas for extended use. The connectors are standard, though, and you can easily hook the torch up to larger tanks when you need them. The hoses are tough enough to stand up to dragging them around the work area, but they are not long enough to give you much freedom of movement. The goggles that come with the kit interfere with a clear field of vision and are too heavy for wearing more than a few minutes at a time. The TI350T does not come with as many tips as the Campbell Hausfeld kit above, but you can add your own tips at a reasonable cost. As long as you are not hoping for a heavy-duty torch kit, you will be happy with this model, and the plastic carrying stand makes it easy to keep all of your parts together, even if you have to tote the setup a long distance to use it on location. The tanks are shipped empty, and hold 10 cf of acetylene and 20 cf of oxygen. This isn’t enough for any major work, but will do nicely for small jobs in confined or hard to reach areas. I’ve always been interested in learning to do some light welding projects. Are these kits beginner-friendly?